Four months since I made the last update of the Ant Genera of the World website, and the less that can be told is that it has been a good time for the Ant Genera of the World database. 167 new records have been added concerning 87 genera! Almost a third of the known genera are concerned. The new records allow to refine our predictions on the unknown distribution of some genera, and so the improvement of future predictions. As a result, 17 new interpolations have been added. Most of the new records concern Honduras thanks to the work realized within the LLAMA project of Jack Longino, this year helped by Michael Branstetter who discovered two very interesting records among several others; Formica captured on the top of a mountain (this is the southern record of Formica for the New World); and the northern record for Paraponera (the bullet ant). Lots of new data have been communicated to me for Brazil thanks to Rodrigo Feitosa who does an excellent job therel within the team of Roberto Brandao (who gave a very interesting talk at the IUSSI meeting). Thank you Rodrigo! During this period, at the beginning of August was the IUSSI meeting in Copenhagen. It was the occasion for me to present my work to many fellow myrmecologists, to see some friends and to develop new contacts. I had a fantastic time there and would like to thank all the people who visited my poster, and for their encouragements. It was great to hear about the website being useful and people to be eager to share new records! I am looking forward to see many of you and have more interesting discussions in the future. At this point, this is my turn to share a few new records, but this time at a species level. I have found the rare and enigmatic Amblyopone trigognignatha (only collected one time in 1948 from one individual) two years ago during a photo session (confusing it with the more common A. pallipes), and recently the ant was identified from my pictures by Alex Wild. More info is available on this story is available on Myrmecos.net. This summer I also collected ants in different places of North Carolina in order to improve our knowledge on the myrmecofauna of this state. I am glad to announce that I have collected (yes, I collected it this time) what I have identified as Hypoponera inexorata! Finally, very recently, we did some collecting in South Carolina, and we captured Discothyrea testacea, a new record for the state (I had no records of this genus for SC in the database). I also suspect this species to be present in Virginia as I collected populous nests of this species only a few miles of the border of this state, but on the NC side. So if you go in Virginia, collect some leaf litter and you’ll have some good chance to find it! So take your hand shovel and hang your Winkler bags! How much an ant can carry? Reading scientific articles is part of scientist every day job. I have to say that if I find that many papers can be classified as interesting for my research, but not necessarily exciting to read (even sometimes boring). The goal of a scientific article is not be exciting but to be useful, to make a point. Having undergraduate students working around, it is easy to tell that they are not extremely enthusiast about reading scientific articles in general. However, once in a while, some exciting papers are published that, I believe, will enthusiast most of their readers and could become one of those examples that professors can then use to explain a concept to their students. Students that could even enjoy them! On arboreal ants, I can think about a few like this that came out over the past years such as the gliding Cephalotes and the red berry Cephalotes (infected by a nematode) of Steve Yanoviak, the devil gardens of Myrmelachista of Frederickson, or the trapping techniques of Allomerus by Dejean. 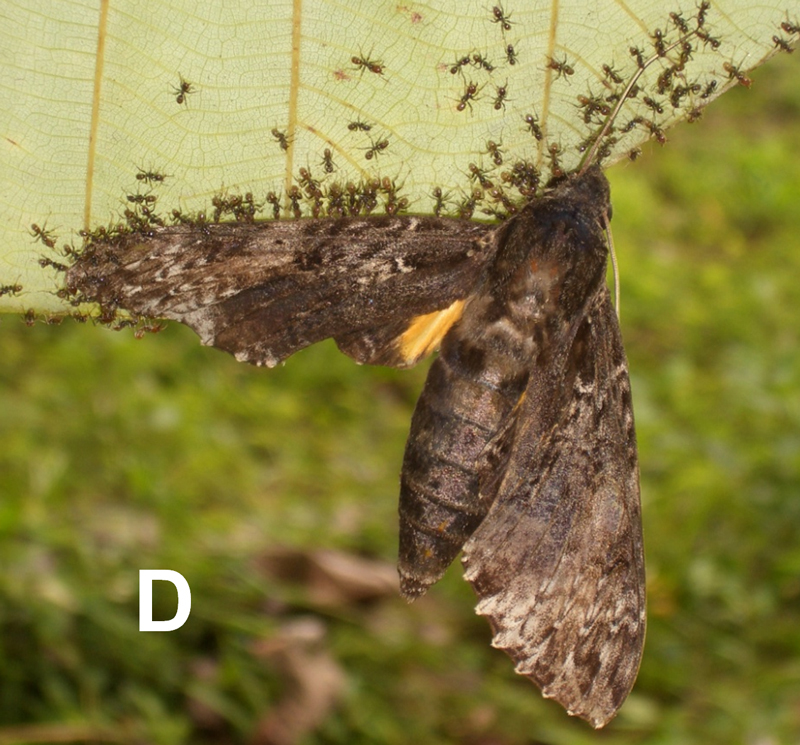 In a new article, still by Dejean and collaborators published in PlosOne, ants reveal one more time some really cool example of adaptations to capture prey. Like the three previous examples, arboreal ants are involved. In this case, Azteca species use the structure of the leaves of their host plant to capture preys… huge preys! Up to 13000 times their own weight. And the authors to compare this with a 70 kg human being able to capture a 935 tons prey. ﻿﻿﻿Wait a second, 935 tons… what could weight that much? That is about eight Boeings 757 full of passengers, or also the weight of a destroyer during the Second World War… Amazing! The pictures provided in the article are great and talk for themselves. Also, do not miss the video in the supplement (it has the quality of a documentary). 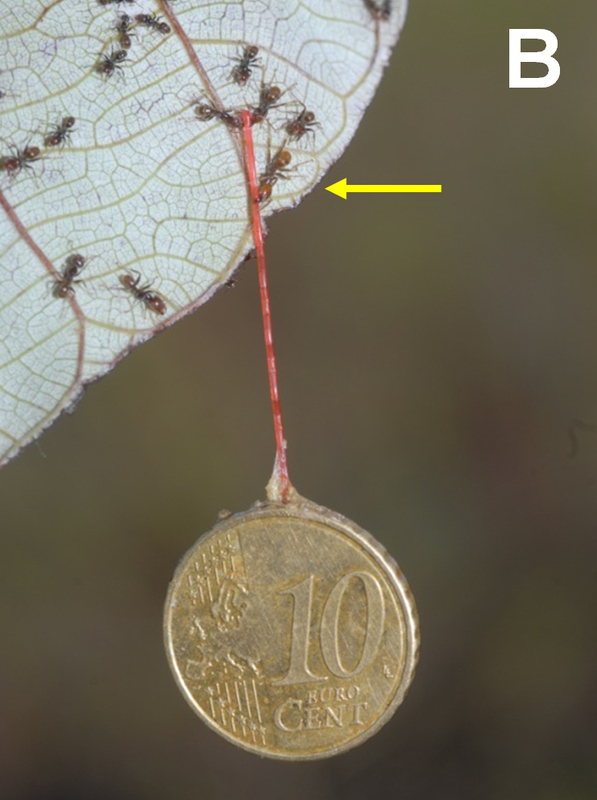 Now the interest of the article is also to show that the relation between the plant species and the ant species is fundamental for the success of prey capture, as well as the side of the leaf used by ants to capture large sized prey. This provides a good example of the different benefits perceived by ants on different myrmecophytic plants. The last update of the ant generic database is only a month old, and I am glad to announce that no less than 110 additions/changes have been made since then. Most of the modifications this time concerns regions of Asia and especially China where I have been able to find lots of new records for specific provinces. The difficulty I have since the beginning of this project for some regions like China has been to find and then understand the publications. Most of the work realized on Chinese ants has been published in Chinese journal which seems to have a limited distribution. The first difficulty has been to find the references of the different articles and then to obtain a copy of them. Hopefully for me, NCSU has an excellent library service! Thanks to them I have been able to have access to hundreds of articles and books which sometimes are mailed from the other side of the world just for my insatiable bulimia of data collection. The second difficulty is of course the reading. Reading Chinese is not an easy thing to do, especially when you don’t understand it, but fortunately, the format of scientific paper coupled with the access to Internet and tools of translation allow me to extract the information I need. At many occasions, I though about the perseverance of Champollion who pierced the secrets of Egyptian hieroglyphs on the Rosetta Stone. Anyway, the maps have now 96 new records (green), 11 new interpolations (blue) and 3 new records for introduced genus (orange). Besides China, a few records have been added for South East Asia, Central Asia, South America or Africa. While most novelties are only novelties in a sense that I did not came across those references earlier, there is a real new one with the discovery of Asphinctopone by Peter Hawkes in Tanzania (published in Zootaxa). This new record extends the range of this Ponerine genus on the East coast of Africa and is also at the same time the southern record. Needless to say that this is a pretty cool new record! I also found very interesting the position of Peter Hawkes who is the director of a company specialized in the monitoring of arthropods diversity in Africa, called Afribugs. I believe that it is during one of those monitoring, that Peter has discovered the new Asphinctopone species. On the website of Afribugs, you could learn about the company but also see some of the awesome specimens collected. For instance, this nice species of Calyptomyrmex collected also in Tanzania. Take a look! Here is a picture that I took in Costa Rica (which survived my computer crash). You can see an Azteca worker attacking an hermit crab. 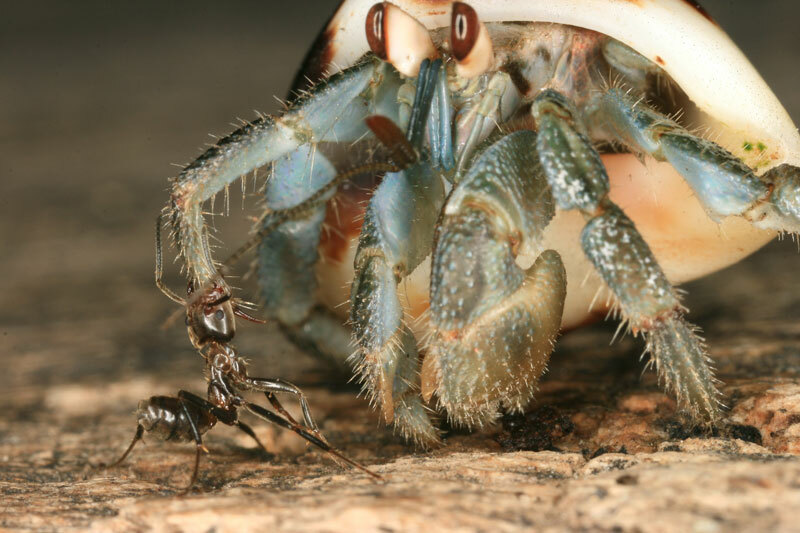 The duel finished by the desertion of the hermit crab. Long time without posting and many things to report. As some of you might now, I spent the beginning of this year in Costa Rica and did a little excursion in Panama. Of course, I took a lot of pictures of ants and other invertebrates, plants, amphibians, lizards … but about 3 weeks ago my computer feel on the ground and since then I have not been able to get my pictures back, at least most of them (hard drive broken). I still have about 250 pictures left, but some series are entirely gone unfortunately. During my trip at Barro Colorado Island (BCI), I had the chance to meet David Donoso, PhD student in Mike Kaspari’s laboratory. Of course, we talk about ants and David‘s work on BCI, where he is interested by the effect of specific tree presence on the structure of leaf litter ants. David is also interested to develop the knowledge and the taxonomy of ants from Ecuador, where David comes from, and at this effect, he orientates me to some of his work (published in a French journal!). David also works on a revision of the very interesting genus Tatuidris (pictures on Antweb). It was the first time that I had the chance to see this beautiful ant under a microscope and they are totally amazing! David provided me some records that I did not know about Tatuidris, and so the new map is now updated! Let’s continue with the new additions of the database, and let me thanks Dr. Mostafa Sharaf from Riyadh who provides me some of his articles and new discoveries about the ants of Egypt, Qatar and Saudi Arabia. Among the main additions, notice the presence of Carebara and Solenopsis in Saudi Arabia; the potential presence of Leptanilla in Egypt and Saudi Arabia, and the removal of Lasius from Egypt (probably a misidentification). Also, note that in the last paper of Omid Paknia and collaborators published a new article on the ants of Iran in Asian Myrmecology. They provide new generic records for Dolichoderus, Myrmecina, Proformica, Pyramica, Stenamma and Strongylognathus, as well as a total of 32 new species records. Note that the change of Paratrechina into Nylanderia, Paraparatrechina and Paratrechina is not yet effective on the maps. Finally I would like to thank those of you who read this blog and communicate with me to improve the maps. It is always a pleasure, thank you! Blogging will take a break for the next two months for cause of travelling in Costa Rica and Panama. I will be taking the OTS course in Tropical Ecology and will come back at the end of March. Hopefully, I should be able to take a lot of ant pictures during my trip. Before to leave, I have to fill a commitment. In a previous blog, I said that if someone could give me 5 good reasons to like Paratrechina (now Nylanderia), I would write a poem. Well, James Trager gave me several reasons, and all good, so here is my poem. I apologize for those of you that appreciate poetry in Shakespeare language, but I felt more comfortable to do so in Rabelais language (but the comparison stop here). Et c’est une brève inspection qui commence. Avant la venue des autres dominantes. Pour nourrir la colonie et ses œufs natifs. D’une odeur ni amicale, ni familière. Pour celles qu’on appelait Paratrechina.